Whether you're on the trail or at the job, you need all the help you can get dealing with the unpredictable elements. Take on the outdoors the right way with a pair of Danner Men's 37510 Brown 453 GTX Waterproof Hiking Work Boots. Manufactured with soft, brown ... (see full details) (see specifications) #DNN37510. Whether you're on the trail or at the job, you need all the help you can get dealing with the unpredictable elements. Take on the outdoors the right way with a pair of Danner Men's 37510 Brown 453 GTX Waterproof Hiking Work Boots. 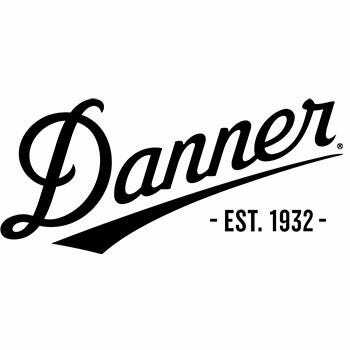 Manufactured with soft, brown full-grain leather and fabric uppers and Terra Force X construction, Danner has built this footwear to be both rugged and exceptionally comfortable.Their waxed coating helps them shed water, and they're abrasion- and scuff-resistant, too. The really cool thing about the waterproof Gore-Tex membranes in these brown boots is that while they lock moisture out, they also allow for great breathablity and comfort. The moisture-wicking Gore-Tex lining and cushioning footbeds round out the comfort features, making each step worth taking. Danner Approach TFX outsoles are ready for some serious action. With triangular lugs, the lightweight outsoles of these men's shoes allow for improved acceleration and downhill braking, and the exterior lugs are great for traction on slanted surfaces. The beveled lugs also prevent any debris build-up from occurring. The TPU shanks in this footwear provides the arch support you need to keep your feet feeling great, no matter where you're walking. Take on the great outdoors in style with a pair of Danner Men's 37510 Brown 453 GTX Waterproof Leather Boots. Put a pair to the test and order yours from the Working Person's Store today. My dad says these boots are outstanding in comfort and he likes the GoreTex, what ever that is. Found my order to be fast and like the boots alot. I particularly like the height of this boot and the free shipping. I have always had good luck ordering from here. Danner Boots: Men's 37510 Brown Waterproof GTX Hiking Boots is being added to your cart.